WILL KNIGHT accepts Havant need a final-day miracle to make the London one south play-offs. They host London Cornish in their final game of the season at Hooks Lane on Saturday (3pm). Though they are only two points behind second-placed Medway the odds are heavily staked against the home side. The Kent side finish their season at home against basement-club Gravesend. It will be a huge surprise if they fail to pick up the win needed to secure their play-off place. For the second successive season Havant look set to miss out with a third-placed finish. Knight is adamant the club are ready to make the step up to the next level. He said: ‘It will be a disappointment if, as it seems likely, we don’t make the play-offs. ‘That was our aim at the start of the season. ‘It will mean we haven’t succeeded in achieving our goals. ‘On the other hand in many ways it has been another successful campaign. ‘We have continued to build and put the building blocks in place for the future. ‘It is important to us as a club that we make the next step up. 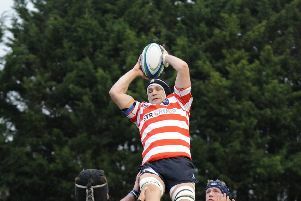 ‘We are not happy playing London one south rugby and want to return to National League level. ‘Our aspirations go even higher than that but at the moment we believe we can do well at level four. ‘We believe that is achievable and sustainable. ‘Our development plans are geared towards that. ‘Firstly, though, we have to get ourselves out of this league which I believe is the strongest at our level nationally. In the forwards Havant’s front five remain the same with Joe Davis coming in at number eight. That means a move to open-side flanker for Tristan Trehan. In the three quarters Darren Bamford returns in the centre with Scott Morris moving to the wing. The visitors have had some good results. So Knight is wary of them and wants to make sure Havant keep their good home form for the whole season again. He added: ‘The worst thing would be to lose and find out that Medway had somehow slipped up. ‘The players are all fired up to put in another shift. We have to do the business and keep everything crossed. ‘In two and a half seasons we have only lost once at Hooks Lane.